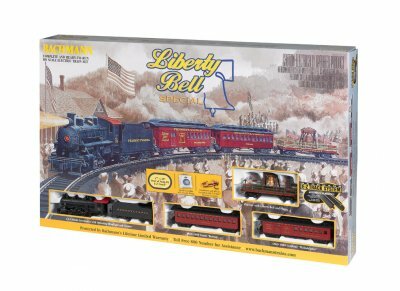 The Liberty Bell Special train set celebrates our cherished Liberty Bell’s historic train travels. The Bell’s first rail trip in 1885 was to New Orleans for the World’s Industrial Cotton Exposition while one of its last trips was to the 1915 Panama-Pacific Exposition in San Francisco. Specially modified Pennsylvania Railroad flatcars were used to carry the 2,080-pound Bell in its wide-ranging travels. The visits to nearly 400 cities and towns over a 32-year span drew huge cheering crowds and special celebrations that often included music, parades, and military salutes. We are proud to present the Liberty Bell Special, and through railroading, let you share in the Bell’s rich history.